Edited by BadHornet, Tue Jul 14, 2015 12:30 PM. This is amazing!! Downloaded the rom and played it on my emulator. Super job on this! Very addicting game! Should be available in the store soon! hey! any news on when these carts will be made, this looks to be about the best homebrew 2600 game i have seen, would love to play it on actual hardwear! also kudos atariage forums for this whole thread, great to see so many people help with input on thiis guys game development! I think Albert is posting them after the Portland show. Edited by K.Michael, Wed Sep 9, 2015 1:37 AM. I was going to pick Crackpots if I win the medal round in the HSC... but I think I just changed my mind. Edited by funkwad, Wed Oct 21, 2015 11:06 PM. Sorry about the AtariVox confusion, it's only used for saving high scores for all of the modes, there isn't actually any voice FX. The game is now available in the AtariAge store! If you buy it, let me know what you think! I played only two games so far and this could be the most addictive of all the games that just came out. Awesome job making this game. Nobody should miss out on buying it. This is the gold standard of Atari 2600 games. Whenever I assess a game's worth, I think, "How would this game have done during Atari's reighn?" This, my friend, would have done VERY well indeed. Kudos to you, sir; this game is AWESOME. Simple, elegant, addictive. Hey just a heads up, I bought this game and it's amazing, but I'm having trouble with high score saving on my AtariVox. It seems the Vox chirps and doesn't save the high score. Not sure if it's my Vox that's acting up or the game. 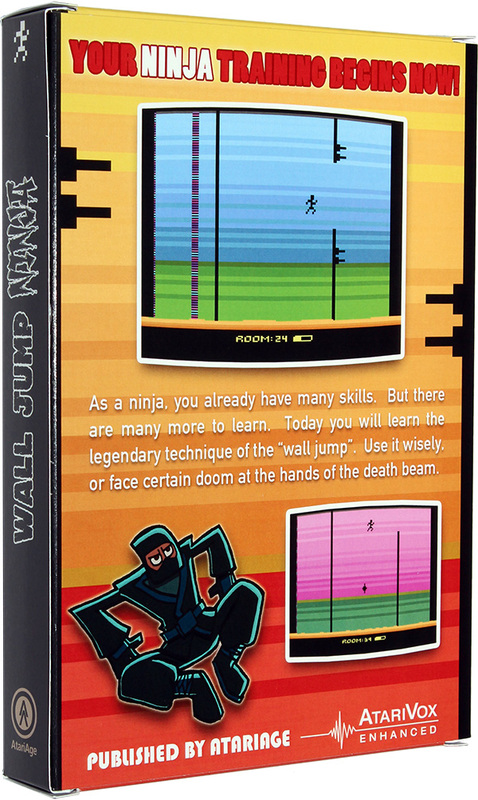 I speaks properly and recalls my old high scores in other games, but high score saving doesn't seem to work in Wall Jump Ninja. 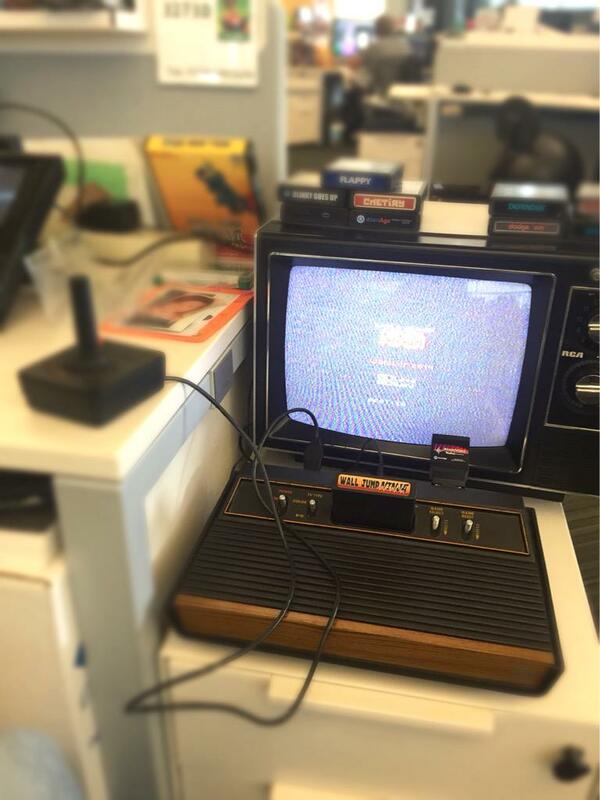 I may be guessing that the Atarivox's memory might be full to record more score. That's not how the Vox works. I own maybe a half dozen or so titles that use it. Each released homebrew game get's it's own memory slot and there is a ton of unallocated memory left for future homebrews. BTW there is indeed a bug with the Savekey/AtariVox+ high score saving/loading code. I'm working on a fix now. Is a box still available for this? 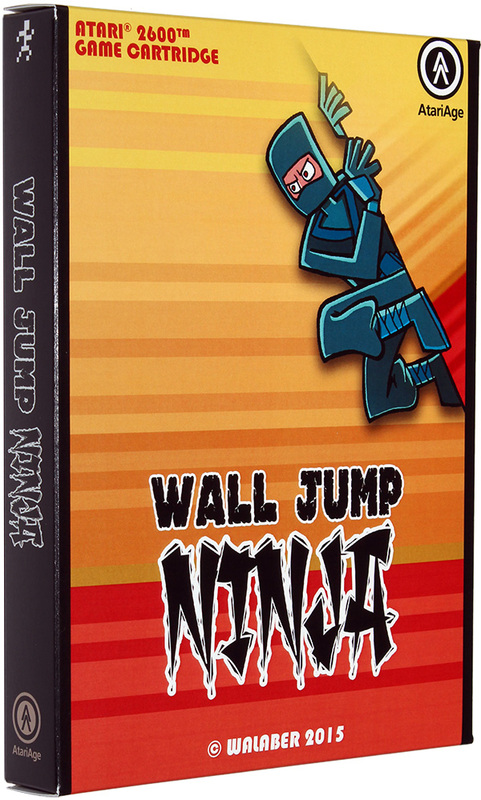 I'm pretty sure I do have some boxes, let me see what I have and I can add them as an option for Wall Jump Ninja.